Product Feature: good moisture-proof performance, shading performance, and high hinder performance. A good plate shape can be guaranteed with the application of full hydraulic control, high precision pressure sensor and servo valve. 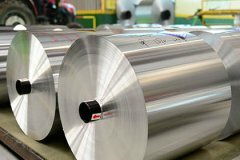 The annual production of foil rolling mill is up to 20, 000 tons. We are honored as a trusted partner by many large enterprises for our high-quality anti-counterfeiting cap stock. And we supply good products with low oxygen permeability, good air tightness, and water permeability.